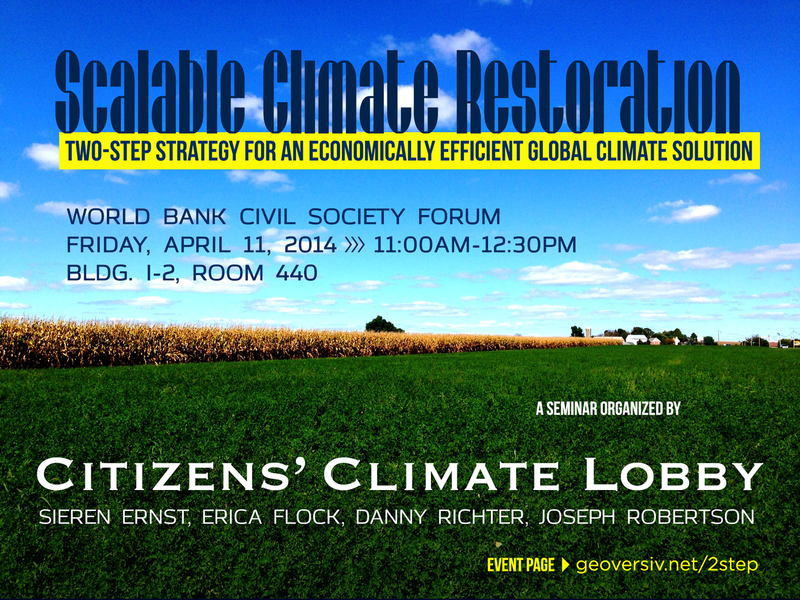 On Friday, April 11, 2014, at 11:00 am, Citizens Climate Lobby will present a new whitepaper outlining a 2-step global climate solution. The plan will focus on putting carbon pricing first, to transform national and regional energy economies, then creating a more effective funding mechanism for needed climate response and deployment of new technologies. Central to the new whitepaper proposal will be the involvement of stakeholders in helping to shape national policies and report local impacts to strengthen the efficacy of a post-mitigation Climate Impact Response Fund (CIRF). This seminar discussion will bring to light economic efficiencies related to revenue-neutral carbon pricing, and how such a plan can build first-level resiliency: a measure of quality of resource availability at the human scale. Please visit the event page—using the short-link: gvsv.be/ccl2step—for more information, updates on the discussion and release of the whitepaper itself.